Thinking of upgrading your computer to Windows 7? The first thing that you can do (for free!) is to download and run the Windows 7 Upgrade Advisor. This free tool from Microsoft will scan and check your computer’s hardware + devices + operating system to determine whether your machine will be able to run optimally in Windows 7. The following are the results of a test done before I upgraded my Vista Home Premium x64 to Windows 7 Ultimate x64. 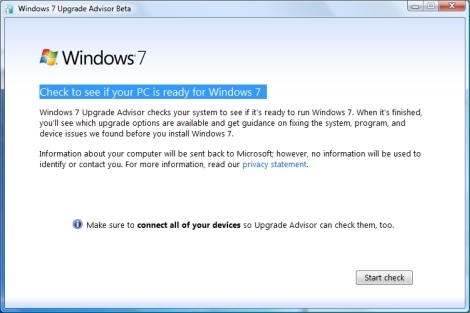 Once installed, you can run Windows 7 Upgrade Advisor. Press Start Check, wait for the check to finish and you will get back a report similar to the one shown below. My report shows that there were no major issues. 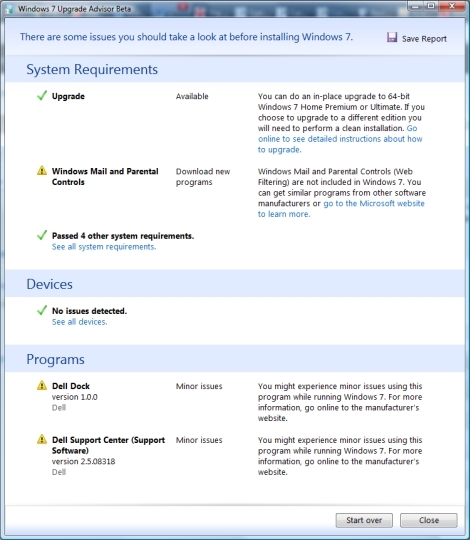 There were 3 minor warnings with Dell’s preinstalled application and that “Windows Mail” and “Vista Parental Control” will not be preinstalled with Windows 7 anymore. I didn’t bother much with that as I know any Windows OS will still run fine without them. The test also shows that my PC meets the windows 7 system requirements. The test results also shows that I have 2 upgrade options of either upgrading from Vista Home Premium to Windows 7 Home Premium or Ultimate. I chose to upgrade to Windows 7 Ultimate and had written about the upgrading Windows Vista to Windows 7 experience. 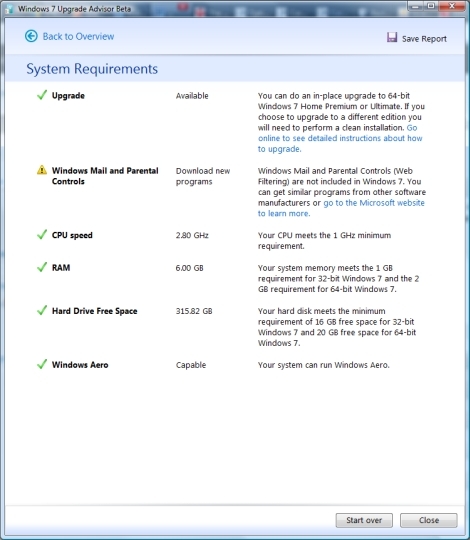 As a general rule of thumb, if your computer is currently running Windows Vista already, you should be able to upgrade to Windows 7 without any problems.